Although some researchers could produce intracellular haem using recombinant E. coli strains, its final titer was extremely low, resulting from the use of sub-optimal metabolic pathways. Furthermore, the addition of the precursors L-glycine and succinate was deemed undesirable for massive industrial production. Thus, it is necessary to construct an optimized haem biosynthetic pathway to enable the efficient production of haem and examine the consequent secretion of free haem. To address this issue, the KAIST team used multiple strategies to produce extracellular free haem by enhancing its biosynthesis in E. coli. First, the capacities of the C4 and C5 pathways to produce aminolevulinate (ALA) without feeding precursors were examined. 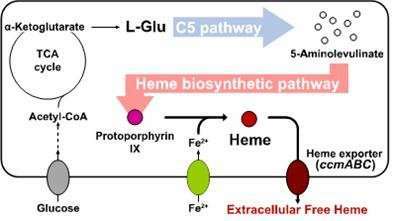 After confirming the superior performance of the C5 pathway over the C4 pathway, the metabolic genes of the C5 pathway and downstream pathways for haem biosynthesis were overexpressed. Then, the metabolic pathways were optimized by adjusting the expression levels of the relevant genes and disrupting the putative haem degradation enzyme encoded by the yfeX gene. Consequently, the resulting engineered strain secreted a significant amount of haem to the medium. Subsequent optimization of the cultivation conditions and the supplementation of nitrogen sources further increased both the titer of the total free haem and the amount of free haem secreted to the medium. Finally, the overexpression of the ccmABC genes encoding the haem exporter further enhanced the production and secretion of haem, producing the highest titer of haem both intracellularly and extracellularly from glucose. Professor Lee said, "The eco-friendly and sustainable chemical industry is a key global agenda every nation faces. We are conducting research to bio-synthesize high concentrations, high yields, and high productivity in natural products. This novel technology will serve as an opportunity to advance the biochemical industry moving forward."